Dear reader, if you are a writer who has not yet attended a writer's conference, may I suggest that, whether you are a beginner or a battle-scarred multi-prize-winning veteran in this "business," a conference can be one of the best investments you make in yourself. Plus, if you have even a wee bit of extrovert in you, it's a gab fest. That said, over the years I've participated in so many writers' conferences, most blur together in a sort of schmoo of vaguely remembered panels and jostling in the corridors and too much coffee and overcrowded ladies rooms... I sometimes wondered, ho hum, what could possibly be new? Well, a couple of years ago it occurred to me that it would be both new and apt for me to look west; after all, the majority of writers conferences I had attended up until then had been on the East Coast, and I am at work on a book about Far West Texas. Plus, my agent, bless her heart, passed away, so I might need another one (whether I do or not remains an open question)-- the agent pitch sessions at a writers conference are always valuable if for no other reason than to practice pitching. After attending the 2014 Women Writing the West conference in Golden, Colorado, I learned so much and met so many accomplished and friendly and indeed, women-writing the-west writers, including several Texans, that I hoped to attend another. Finally this October it was possible, and that meant a journey to Santa Fe, New Mexico. 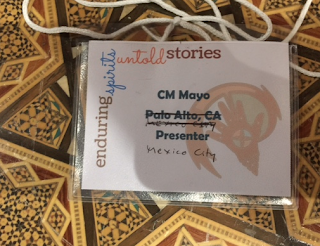 My participation this year was on the panel "Writing Across Borders and Cultures" with Dawn Wink and Kathryn Ferguson and I gave a workshop on "Podcasting for Writers." > Transcript of my remarks for "Writing Across Borders and Cultures" here. 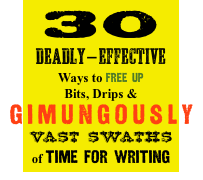 > Handouts for the workshop "Podcasting for Writers" here and here. 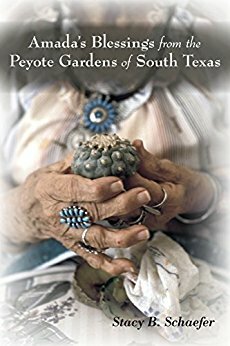 One of the highlights for me was meeting anthropologist Stacy B. Schaefer, whose biography of Amada Cardenas, Amada's Blessings from the Peyote Gardens of South Texas (University of New Mexico Press) was a finalist for the Women Writing the West Willa Award for Scholarly Nonfiction. Of course my book in-progress about Trans-Pecos Texas will include some discussion on peyote, since its habitat, mainly in South Texas and Northern Mexico, includes a patch of the Big Bend, which is in the Trans-Pecos. 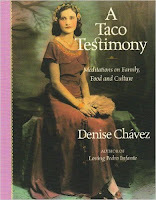 Schaefer is one of the leading scholars on peyote and her story of the first federally-licensed peyote dealer Amada Cardenas is essential reading for anyone who would seek to understand the history and ritual of the Native American Church, as well as a vital part of US-Mexico border culture and history. 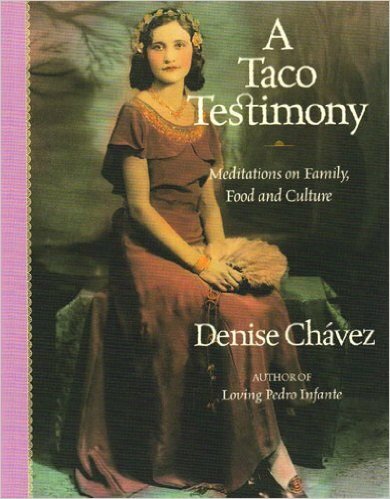 Another highlight was Denise Chavez's magnificently theatrical luncheon keynote, a reading from her book, A Taco Testimony. Most writers' conferences offer a panel on book marketing. In my newly-forged opinion, ideally, all writers' conference panels on book marketing should feature an acquisitions librarian. Would that he or she could be half as wickedly excellent a speaker as Alice Kober. Another sparkling keynote, "The Right to Write," was delivered by Julia Cameron, and at the Willa awards banquet, Navajo poet Luci Tapahonso read her exquisite works. 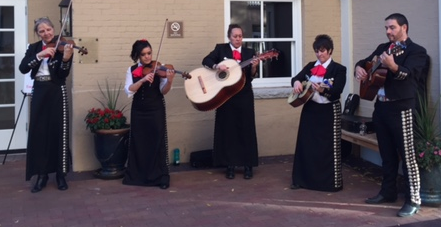 Further entertainment was provided by this fine mariachi band. Apart from being entertained, noshing on buffet chicken, gleaning loads of practical advice, and selling books, a writers conference offers the chance to put faces to names. Among them: Amy Hale Auker, author of The Story is the Thing; Brenda Black; Kathryn Ferguson, author of The Haunting of the Mexican Border; Laurie Gunst, author of Born Fi' Dead and Off-White; and Lisa Sharp, author of A Slow Trot Home. 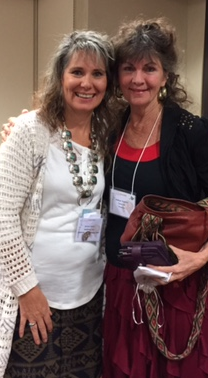 And among the many writers I was fortunate to meet back in 2014 and cross paths with again were Andrea Jones, Pam Nowak (who did so much to make this conference run so smoothly! ), Jane Kirkpatrick, Cynthia Leal Massey, Carmen Peone, Heidi Thomas, Susan Tweit, and Dawn Wink. Susan Tweit and Dawn Wink, dynamic duo, not only gave a terrific jump-starter of a workshop on mapping stories, they also smoothly MC'ed the Willa Awards Banquet. 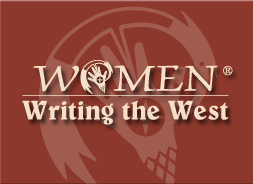 How to join Women Writing the West and attend their next conference? 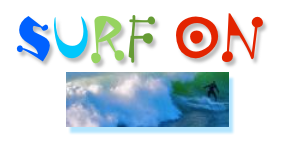 You will find the whole enchilada o' info in their website here. My one other escape from the conference was a hajj of sorts: a visit to Allá, the best Spanish language bookstore north of the border. So many writers and translators over the years have told me about Allá. (I mean you, José Skinner, Raymond Caballero, Patricia Dubrava...) I had heard that Allá was on the southwest corner of the Plaza, but on my previous visit to Santa Fe, I couldn't find it. This time, armed with the precise address, 102 West San Francisco St, and my smartphone's map app, I discovered that it is a little ways past southwest corner of the Plaza, and you won't find a sign on the street. However, as you can see in the photo below, there is a reference— Allá Arte- Libros - Música— pasted in between some steps on the stairs. 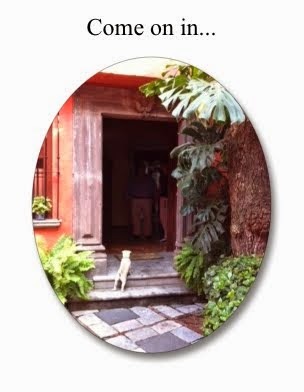 So head on up to the second floor, hang a right, and there you may enter into the bright warren of rooms all filled with tesoros, both literary and scholarly—and if you're lucky, meet the owner himself, James J. Dunlap. 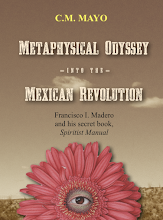 Yes, here you can find Mexican writers such as Agustín Cadena and Mónica Lavín. 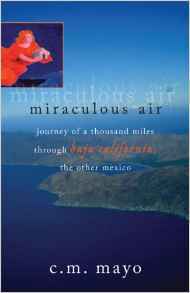 And bless his corazón, he had books on Mexico in English by my amigos, Bruce Berger and David Lida and... drumrrrrrrroll... he had two of my books sitting out on the table, Mexico A Traveler's Literary Companion and Sky Over El Nido, and he said he had just recently sold another title, Miraculous Air, my memoir of Mexico's Baja California peninsula. 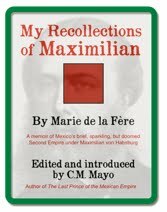 Speaking of miracles, my luggage accommodated the pile of books I hauled out of there, including some Mexican scholarly works on the Apaches and Comanches that, from Mexico City, I have been trying to hunt down for over a year. Somehow I also took home a fat hardcover first edition of a memoir of life among some indigenous people in Tierra del Fuego. Visit Allá at your own risk! If you dare, tell Jim that Mayo told you to ask about a-gogo and psícadelico. Wherever there be a parade of people, there's an opportunity for a writerly exercise. This is a quick and easy one, or rather, five. The idea is to look-- using your artist's eye, really look at individuals and come up with two words (or 3 or 4 or 7) to describe them. Yep, it is that easy. It helps to write the words down, but just saying them silently to yourself is fine, too. 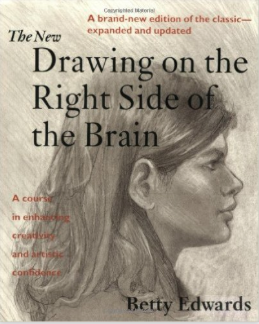 The point is to train your brain to pay attention to detail and generate original descriptions. He had stubbly hair and tennis shoes the beige-white of skinned trout. One need not use all this detail; the point is to generate it in the first place-- to get beyond stereotypes (eg she was a short Asian woman) and write something more memorable and vivid. She had a knife-like bob and slippers the color of chocolate pudding. She carried a fat purse. Her walk was brisk, her gaze dreamy. Perhaps she was older than twenty. She wore a wedding band on the wrong finger and an elephant hair bracelet. >> How to select the detail and avoid clutter? See "On Respecting the Integrity of Narrative Design: The Interior Decoration Analogy." 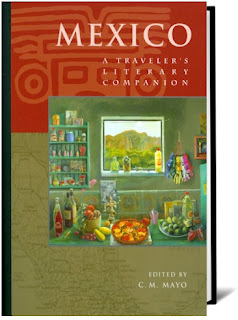 "On Seeing as an Artist or, Five Techniques for a Journey to Einfuhlung"
This year marks the 10th anniversary of the publication of my Mexico: A Traveler's Literary Companion anthology. This week I'm off to the American Literary Translators Association conference in Oakland, California, where, thanks to my amiga, Jill Gillian, editor of Argentina: A Traveler's Literary Companion, I will be participating on roundtable discussion panel of editors of the Whereabouts Press Traveler's Literary Companion series: founding editor David Peattie; Jill Gibian (Argentina); Alexis Levitin (Brazil); Ann Louise Bardach (Cuba); and William Rodamor (France). 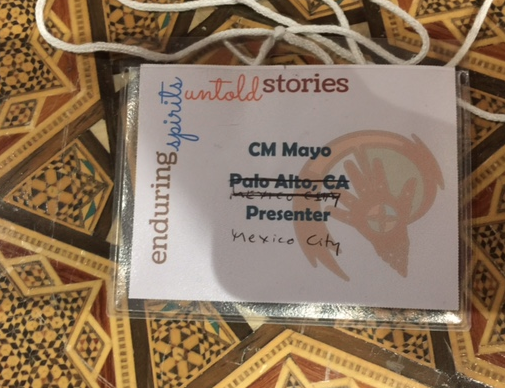 Whereabouts Press founder David Peattie's concept of the series is visionary, and I was truly honored to have been invited to edit the Mexico collection. 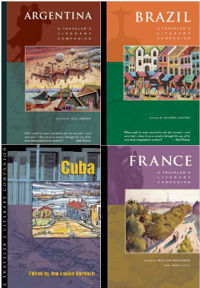 As the Whereabouts Press website says, "unlike traditional guidebooks, our books feature stories written by literary writers. Through these stories, readers see more than a place. They see the soul of a place." "We can hear a country speak and better learn its secrets through the voices of its great writers. An engaging series— a compelling idea, thoughtfully executed." HEREWITH, THE WHOLE ENCHILADA OF LINKS. AS THEY SAY IN MEXICO, SERVE YOURSELF WITH THE BIG SPOON! 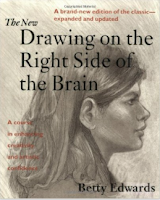 > Links to buy this book from amazon, Barnes & Noble, IndieBound, and more. 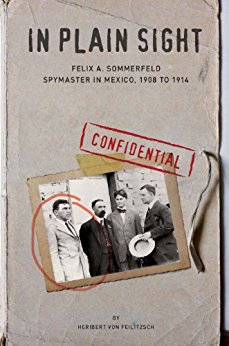 "One of the outstanding contemporary works on this country"
"This delicious volume has lovingly gathered a banquet of pieces that reveal Mexico in all its infinite variety, its splendid geography, its luminous peoples. What a treat!" Because I am at work on a book about Far West Texas, my translation endeavors have slowed to a bit of a crawl this year. 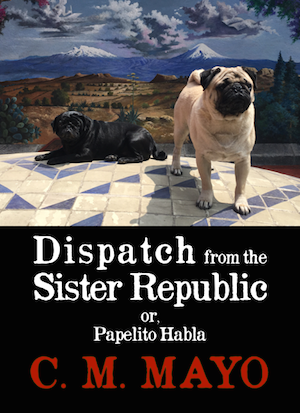 That said, I should soon be finished with my translation of Mexican writer Rose Mary Salum's award-winning collection of short stories, The Water that Rocks the Silence. More about that anon.